Want to win a Microplane Grater? Enter our giveaway today! One of my most-used kitchen tools is my microplane grater. Whenever recipes call for grated cheese or citrus zest, my Microplane grater makes easy work of the task. If you’re like me and looking any time-saving kitchen gadget, checkc out our giveaway today—the Microplane Elite Series Coarse Grater. This handy grater is just one in Microplane’s long list of culinary tools that has transformed the way chefs and home cooks zest and grate a wide variety of ingredients for the best and most flavorful gourmet cooking and baking recipes. I can honestly say it is one of the best purchases I have made in awhile. The solid stainless steel construction makes this a stable and versatile tool. It is light weight, has a soft-grip handle, is exceptionally sharp with a large-wide grating surface which means it is capable of grating hard and medium-firm cheeses, as well as fruits and veggies from pears, apples and coconuts, to potatoes, squash and cabbage. The Elite Grater includes a transparent reusable cover that doubles as a catch feature with a generous 1-cup capacity; and the rubberized frame allows you to safely hold the grater vertically for grating onto a cutting board, plate or into a bowl. I am super excited to know that now I can safely zest, spice and grate all my favorite foods. Simple and easy, dishwasher safe, and made in the USA. This will become your go-to essential kitchen helper. Leave a comment below telling us why you want to win this grater. Love the catch feature, very cool. I do not own a grater, so this would be great to win! I like both on facebook. I love to cook and the microplane grater would be so handy in a variety of ways. I could use it to grate cheese, garlic, nutmeg and so many more foods! I like to have it so my job of cooking will be easy. I like to use gadgets that save time and effort when preparing food. This looks like a real plus to have in the kitchen. I won’t have to use a paper plate to catch what I grate, it will all be in the grater, this is too cool! I’d love to win this grater! My grater just broke last week. I would love to win this! I can’t believe I still don’t have a grater after all these years! So many recipes I see that I could make, but since I don’t have a grater I don’t make those recipes. So silly! I’d love to win! I need an easier way to incorporate fresh garlic in my meals! I love that it’s in the grater! I’d love to win it! This grater would be a wonderful kitchen helper for me each day. Love it. thanks. 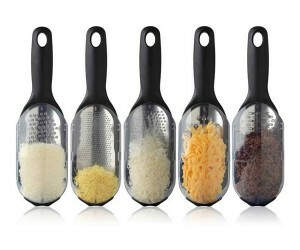 I would love to own one of these ..it looks like it would be very useful for grating cheese and garlic. I grate so much cheese, and my current grater is super old and is wearing out. I really like how this grater has a handle – and it would be a great help in my kitchen!! looks safer than my box grater! no sliced fingers! I love that one cup catch container. I would get a lot of use from it. I love this microplane! I have an old one that looks more like a rasp, and doesn’t have a cover/catch cup feature; and I believe it grates more finely, it’s ok for nutmeg and such but not for cheese; I needed grated cheese for a lasagna yesterday and spent forever trying to chop/grate with a knife. I see myself buying one of these in the very near future (unless, of course, I win this which would be fantastic!) Thank you for all your good information and giveaways, you two rock! I’d love to win and use this microplane but FB says there is no Microplace Kitchen listed so I can’t like it, No posts were found for “Find all places named “Microplace Kitchen”” that were shared with you. I think it should be MicroplaNe Kitchen? This just looks so handy! I love the idea of knowing how much I’m grating as I’m grating it. would like to have this since i do not have one. I like both of your pages and get your email. I would love to have this because I don’t have a microplane grater. 🙂 I lost mine when we moved. this one looks awesome too. I’d definitely use it a lot. I love that it has a cover to hold what you grated. I would use it for freshly grated parmesean cheese. I want to win this grater because I love that it can catch what you’ve grated, and I’m a grater fanatic! Cheese, chocolate, nutmeg, you name it – I grate it! This would be awesome to have in the kitchen for everyday use, especially for cheese! I would love to win this fabulous grater as it would come in handy when cooking, baking and creating a plethora of meals and baked goods for my friends and family! “Liked” Microplane Kitchen on FB. I’d love to have this grater to grate fresh gingerroot into my hot tea! This could really help me in adding the final touch to a dish! I would love to win the Microplane grater to use in my kitchen. I have one now, but it does not have a handle. So, I’d love to have one with a handle. I have one that I use often-the long necked kind. This one would be “grate” for measuring out portions in the tool itself! I would love to be able to safely zest citrus and other things! This looks like a great grater. I like the fact that it has the one-cup catch container. Next fall, I will be moving into my first apartment as a college senior. As a nutrition and dietetics student, I love cooking and bringing out creativity and nutrition through my meals. This microplane grater would be an absolutely wonderful addition to my kitchen! I would really like one of these for garlic. Nice….. I would like to win this grater! We have the microplane classic zester/grater, and it works stupendously! The transparent cover is what really grabbed my attention! Id like to win for easy shredded cheese and garlic. Liked on facebook and email subscribed. I enjoy the zest from lemons and limes. I would love to win this to zest fruit & hard cheeses. I like you on Facebook & I am subscribed to your emails. I love that it catches whatever your grating…makes cleaning up seem a lot less messy! Because microplane is the best grater there is, and I would love to have one of those in my own kitchen!! I have the old grater my mom gave me. I think it would be nice to have a new one to go with it. I would love to win a Microplane Grater. I frequently grate my fingers with the one we have now. I’d love a microplane grater. Have never had one. Wow, the catchment design is brilliant! I’ll be up in the kitchen adding citrus zest, nutmeg, garlic, ginger and parmesan to everything. Not all in the same dish though 😉 I’m buying one today and if I’m lucky enough to win I’ll give it to my mum. I wouLd. love to win this so that it could help me making healthier meals for my family! i love cooking and this would make it so much easier! Would love to win the Microplane grater. I’ve never seen one with a “catcher” before. Awesome idea! I’d love to win, as I’m experimenting with Grilled Cheese recipes! I would love to win one of these awesome microplane graters! I am a microplane “addict” (I even mince my garlic using one) and my current one is about to kick the bucket. I am a long-time subscriber, and “Like” both you and Microplane Kitchen on FB! I have bought a few graters, but none do the job like they should. This one looks different than any I’ve seen or bought. I believe this will chop my garlic and ginger the way it’s supposed to. I pinned the grater. Hope that counts as I’m not on fb. Microplanes are a nice tool to grate cheeses for omlets, quesodillas or veggies for a salads. The clear cover cup is super nice to the catch the ingredients. This would be much easier to clean. I would love this little grater for the lemon bars I make for school lunches. I really like the catch container on this one! I would love to try it out, particularly for grating nutmeg. I have “Liked” Microplace Kitchen on Facebook. I like that it includes a transparent reusable cover that can hold 1-cup. My grater is old and it doesn’t do any of the things that this one does! I would love to win this and add to my kitchen gadgets, as its very good to have cover to hold grated stuff, and i do use it for my morning tea till dinner, so yes this will be great addition to my kitchen. Just love kitchen gadgets and would love to have a grater for zesting lemons especially and for grating! Thanks. I have “Liked” Microplane Kitchen on Facebook. I think that it’s great that it has an attachment that can hold a cup. I like that it catches the grates for you. I really need a grater because I do not have one!! What a really cool looking grater. I would love one. I don’t have a grater, and would love to have one. Love the shape, more user friendly! The winners are Samantha W, Shirley, A, Casey, Victoria C and Dorothy H. You’ll receive an email from us about how to claim your prize.